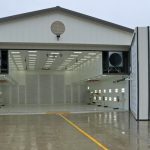 Our engineers provided mechanical, electrical, plumbing and fire protection services for the Air Force Base’s spray hanger. Project was designed in Revit and was LEED Gold Certified in 2014. 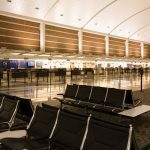 Our engineers provided complete lighting and diffuser design for a renovation throughout the entire length of both concourses. New lighting systems included full digital operations and programmable control capabilities. 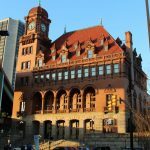 Dunlap & Partners provided mechanical, electrical, plumbing and fire protection for this 1901 historic railroad station. A U.S. National Historic Landmark, Main Street Station ceased providing train service in 1972 due to the James River flooding caused by Hurricane Agnes. To make matters worse, the station was damaged by fires in 1976 and 1983. Main Street Station saw no rail passengers until 2003, when it was renovated and returned to service, reopening on December 18, 2003. 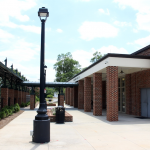 Our firm provided M/E/P/FP design services for the renovation of a historic train station in downtown Kannapolis, N.C. Spaces include two holding areas, ticketing, concessions and a loading platform area. M/E/P/FP engineering design services were provided for a 60,000 SF addition to an existing terminal building for a new 8 gate concourse. 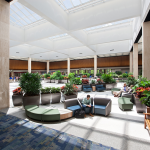 The expansion plans provided a new baggage claim wing, ticketing wing, and gallery area. Central systems upgrades included new boilers, a chiller, a cooling tower, emergency generator, fire alarm and access control systems. 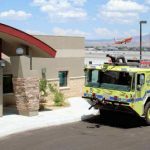 The client required that the airport remain operational at all times so careful coordination with existing services and operations were critical to the success of the project. Mechanical, electrical, and plumbing engineering design was provided for a new 22,000 SF, two-story training facility. 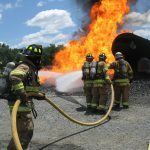 The facility is used to simulate aircraft fires and rescue procedures. 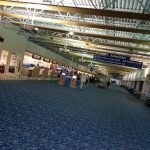 Dunlap & Partners provided M/E/P/FP design of a 4 gate concourse expansion and additional baggage claim carousel in 1994. In 1996 our firm provided design for new public garages. In 2000 we provided design for a new rental car deck and in 2003 a new 8 gate concourse which included a renovation and modification of the terminal to separate arrival and baggage handling from departure with ticketing and security. Our engineers also provided design for a new central utility plant and new FIS facility. Our engineers provided M/E/P/FP design services for a new facility housing 5 apparatus bays, dormitory space, kitchen, 80 MHz communication system, cascade system and administrative areas.